This week's tablehopper: it's tops. Late-night bite at It’s Tops. You see that waffle? Yeah baby, old school—especially with those little pats of butter. 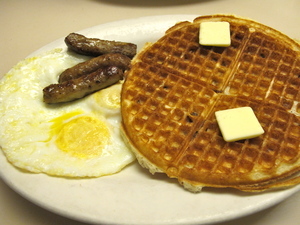 What you can’t see is inside that waffle there are strips of bacon. Oh hell yes. Bacon. Waffle. That is exactly the kind of meal you want at 1am after running around the Treasure Island Music Festival all day in the chilly wind, getting rained on while waiting in line for a bus back to SF, walking for blocks in the SoMa wind, and fighting to get a cab with a bunch of other festival-goers after getting dropped off at AT&T Park… It’s enough to make someone freaking hangry—hence the additional sausage on the side. Meat-tastic! Thanks to It’s Tops for being my little bacon beacon (open since 1935, yo!). Tonight I’m going to a friends and family dinner at the soon-to-open Locavore, so I’ll share more about it in the Friday issue (which is when you’ll also be able to read about Grub on Valencia, which is finally opening this weekend). And for this week’s giveaway, I have a special kind of sugar mama: tickets to the legendary Yusef Lateef’s Friday night show at Grace Cathedral! Maybe I’ll see you there? Today’s hot SF topics: the Giants (!! ), and who made it in the Michelin Bib Gourmand list (restaurants serving two courses and a glass of wine or dessert for $40 or less, tax and gratuity not included—although hmmm, some of these selections strike me as a bit challenging, unless you only order a salad). Discuss.